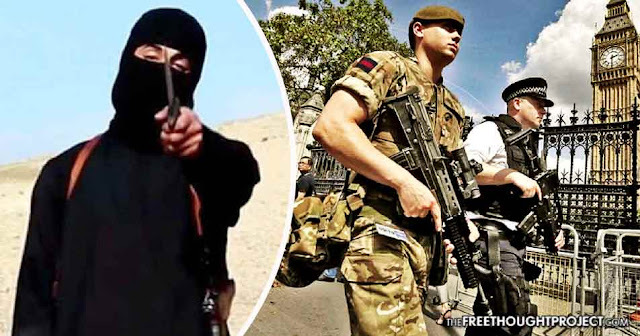 (Matt Agorist) Monday, the United Kingdom was shocked when Salman Abedi, allegedly acting under the flag of ISIS, detonated a “highly sophisticated” nail bomb at Manchester Arena, killing 22 people, including young children. On Thursday, we’ve learned that Abedi’s friends and relatives reported him to MI5 for being “dangerous” and that he had the potential to be a suicide bomber. Twenty people are currently in critical condition and dozens of others are currently recovering. Hundreds are grieving the dead, and now we know this could’ve all possibly been prevented. Abedi was reported to authorities for his terrorist intentions — not once — but twice. According to a report in the Times, his friends and family notified authorities of his terrorist intentions once this year, and once five years ago. Abedi’s support for terrorism was reported this year to the security services, and friends had called Britain’s anti-terrorist hotline five years ago with concerns about his views, it was claimed. He was reported for violent statements, including a claim that being a suicide bomber was “OK”. As of now, it is unclear whether or not Abedi had been under any form of surveillance. However, we’ve since learned Abedi’s younger brother, who was arrested Wednesday night in Tripoli, Libya, was aware his brother was planning the attack. Abedi, 18, has confessed that both he and his brother were members of Islamic State. Related "US Led ISIS Coalition" Connections to John McCain | Did CNN Just Admit The US is Helping ISIS? As for why they didn’t act on the information, the Times reports that intelligence sources have emphasized how difficult it is to assess suspects on the periphery of investigations. Against a backdrop of limited resources, security agencies and police have been deluged with the number of terror suspects and acquaintances they must triage. However, perhaps if the intelligence agencies in the West were less concerned with mass surveillance and gathering intel on quite literally everyone, they might not have missed the report of a suicide bomber in their midst. Perhaps, if this massive spy state growing over the western hemisphere actually worked to deter terrorism instead of quashing dissent and surveilling innocent citizens, those young children would still be alive today. Sadly, however, the spy state appears to do nothing to stop terror and only serves as a massive data collection arm to further the control of the establishment. It seems the only peopel worried about Abedi’s terrorist intentions were his family. As his friends and family told the Times, his father had been so worried about his son’s radicalization in Manchester that he demanded he move to Libya and confiscated his passport. His father was persuaded to return Abedi’s passport, however, after he said that he wanted to make a pilgrimage to Saudi Arabia, it was reported. Before returning to be a suicide bomber in Manchester, Abedi had been living in Libya. Authorities are attempting to find out if he received training at a terrorist camp in Libya, and whether or not he visited Syria. Thanks to the United States’ intervention in Libya in 2011, the once bastion of African freedom has since descended into utter chaos as terrorists and warlords reign supreme. Because of this expansion of terrorism — fostered almost entirely by US intervention — it is indeed likely that Adebi did train to be a suicide bomber in Libya. Unfortunately, the reaction from the West to the Manchester bombing will be more of the same — war — which will foster more terrorism and create more resentment, leading to more attacks. Even Abedi’s sister noted this in an interview with the Wall Street Journal, saying, “I think he (Adedi) saw children – Muslim children – dying everywhere, and wanted revenge. He saw the explosives America drops on children in Syria, and wanted revenge. Whether he got that is between him and God,” she said. Aside from more war, the US and their counterparts in the UK will likely continue to fund and support extremists as a means of destabilizing the Middle East, which will certainly facilitate more death and destruction. Disgusted with MI5 & MI6 facilitating extremists which appears to have resulted in the Manchester attack and many more in Libya itself. Until Americans and the West in general wake up to the root cause of terrorism, this vicious cycle will continue to play out until there is perpetual turmoil in every country across the entire globe.